The goal of this tank is to attempt to re-create a bio-type that is based completely on Spring Creek in North East Oklahoma. 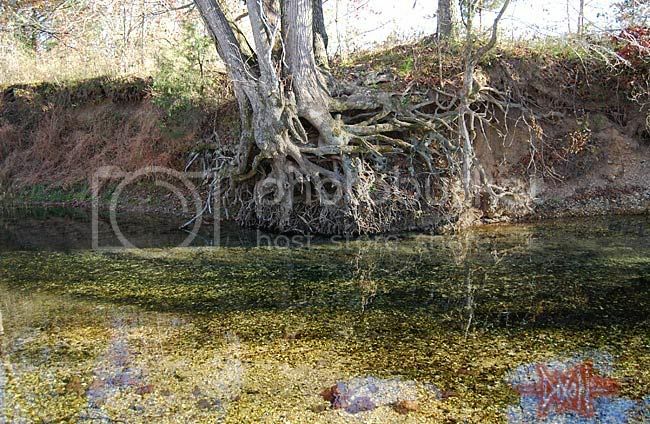 The creek is considered a "Pristine Ozark River" and everything in the tank has come directly out of the creek itself. I have my Oklahoma Lifetime Fishing License (as does my spouse) and we contacted 2 local streams biologists and the Oklahoma Fish & Game Department and got permission from the land owner before collecting. Efforts were made to ensure no threatened or endangered animals were taken or harmed. The Aquarium I used is a 3 foot long "45 gallon show" tank. Tank filtration is an Emperor 400. Circulation and oxygenation is provided by a 5 foot "bubble wall" placed underneath the riffle gravel. Natural drift wood, substrate, plants and leaves are taken from within the creek's banks. An unidentified larval insect similar to stonefly or damselfly larva...Sorry, no picture yet But I did just see it again this week so I know it has survived the power outage. Unfortunately one of these came in with a large cyst probably inhabited by some type of parasite. 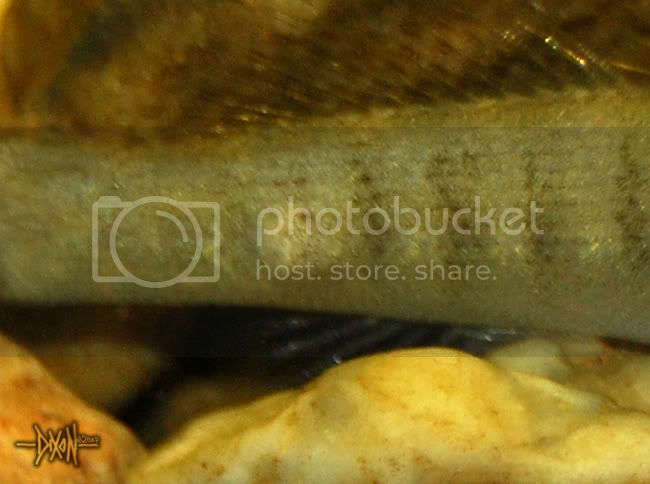 Its behavior is not like the other darters as he is more likely to go to the top of the tank. 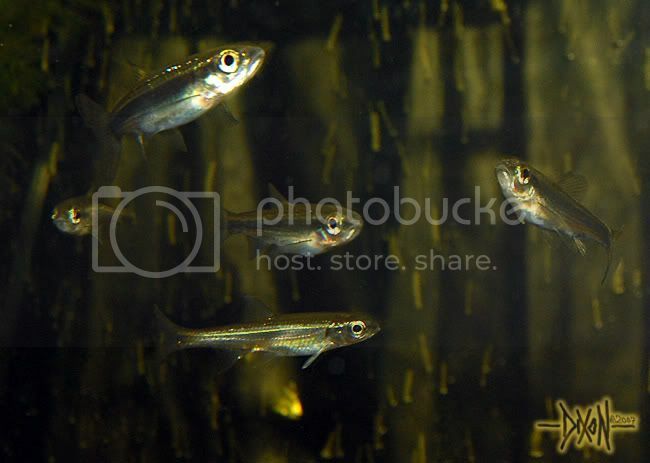 There are also 2 Gambusia affinis holding "bioload" place for some Spring Creek native killi fish I hope to get in the Spring when the water warms back up again. Thanks goes to the North American Native Fish Association (NANFA), Micheal Tobler from OSU and Jennifer Owens of the SCC for their generous help and information. Feedback is welcome and more pictures will come as I can borrow better lenses! I have to say that last spectabile photo is fantastic. Keep borrowing those lenses. 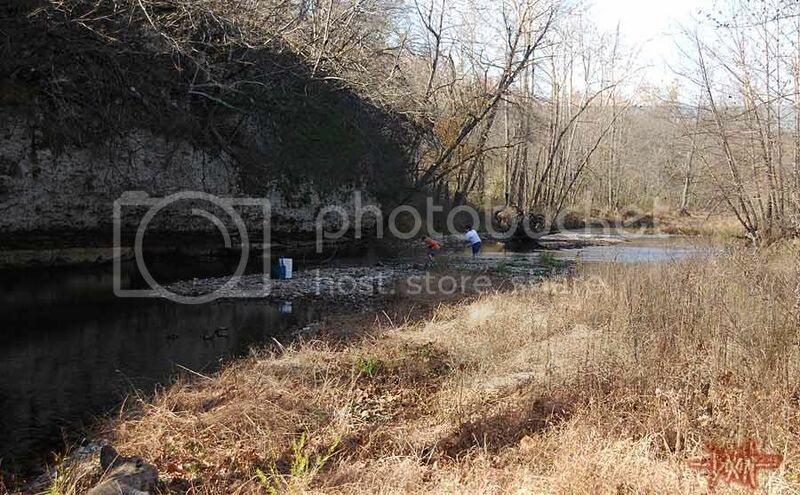 I would love to do that for one of my nearby creeks, but all we have are sunfish, bullheads, mosquito fish, and mud. Not exactly a feasible combination in your average aquarium. My dad's house, however, does have some rocks and a couple minnow species, which I may try to make a tank for soon. I'm more into sunfish than minnows though, so I'm not sure how likely that is that it will happen. 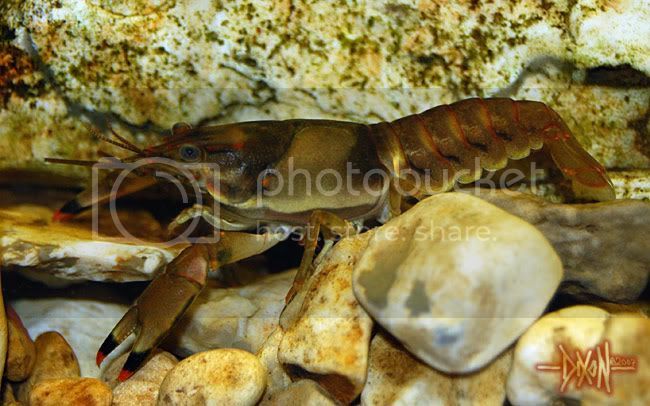 Those are some beautiful crawdads you have there, and your lucky to have seen them breed. I believe Orconectes normally breed in burrows. I've also noticed that darters from certain places(particularly up north) tend to have more black than the ones from other areas. At least that's what I've noticed with rainbows and orangethroats. Do those of you who have kept crays in the aquarium think I have "overstocked"? 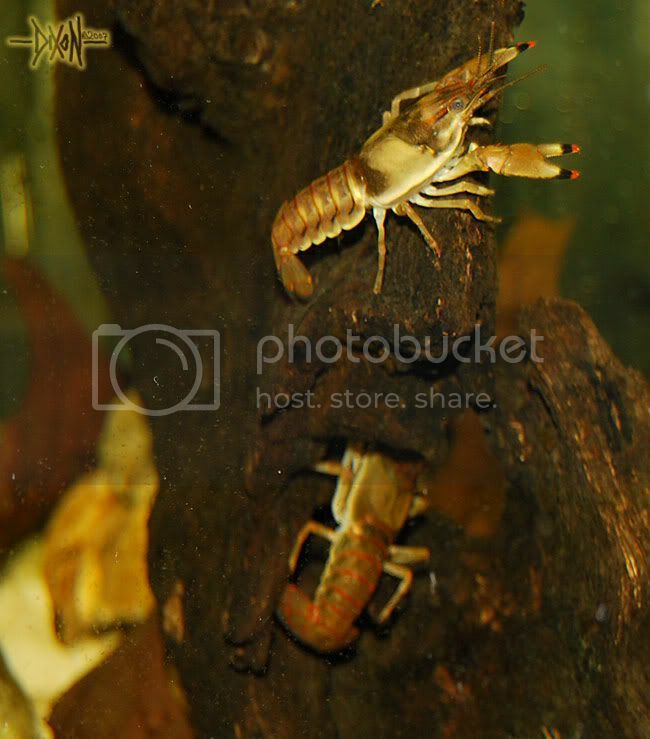 Those crayfish are really pretty. After many tries over the years, I finally decided keeping crayfish requires a devoted tank. I just don't like 'em enough to justify that. Just seems they are eating the plants, eating the fish, eating each other or excavating the substrate. The only one I ever had that didn't give me trouble lived in a 20 long with a musk turtle and no plants or fish. Every once in awhile I will keep a big female in berry and release the hatchlings into my tanks. It's pretty rare for one to avoid being eaten long enough to grow to any size. You could fit about 20 in that tank if they had enough hides. 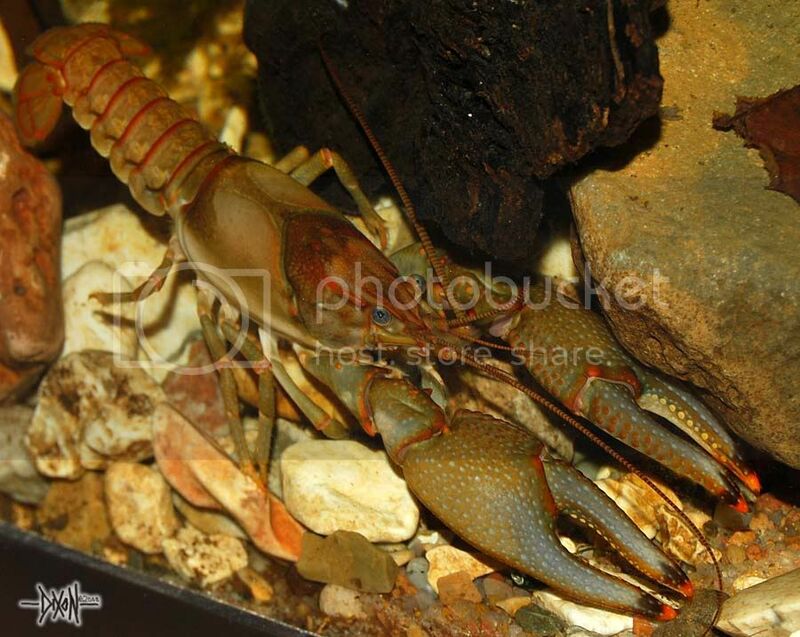 You need at least one cave or some other kind of secure place for each crayfish. I not, they'll kill for hide spots. I had a female P. clarkii that has killed every male I put with her, even if there were 5 hide spots. Sometimes they just don't get along. This is a really great thread. Thank you for sharing. I think a lot of us would like to do an aquarium devoted to just one local watershed. 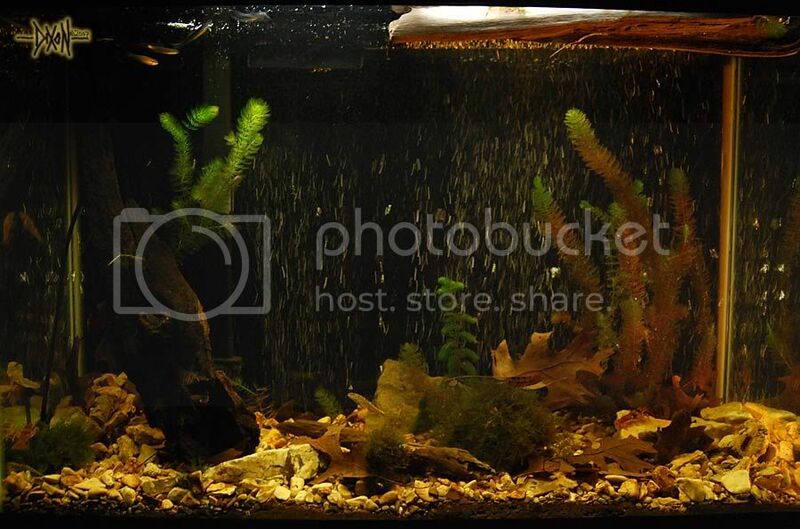 These kind of aquariums can be used as great educational tools too. It doesn't even have to be in a public place, just educating some people when they visit your place is a great way to start. Those pictures are great too. I wish I could get my fish to stay still...I'm working on voice commands...ha. I know it takes a good amount of time to get a good shot of fish in an aquarium, and these are really great. Keep up the good posts! ...I'm working on voice commands...ha. I knew there had to be someone else out there that tries to talk to their fish! I do it a lot when trying to take pictures too. I agree with what Nate said. I want to set up a Flint river tank. Here at my house there is a little creek with some rocks instead of the mud at my grandparents' house, but the only fish we have are creek chubs, bluehead chubs, yellowfin shiners, bullheads, and redbreast sunfish, three of which are piscivorous. So I'm left with bluehead chubs and yellowfin shiners, and maybe some Orconectes virilis. Though, it would be interesting to watch the chubs nest and breed and the shiners to rush in and lay their eggs. Then the fish and crawdads would have a lifetime supply of mini-sushi when the eggs hatched. Edit: Dixie chubs, not creek chubs. I just caught one and it turned out to be a dixie chub. Very nice thread. Keep the pictures coming! I have a bit of crayfish experience. I have learned that if there are enough "hides" That you can keep many together. When they become most important is during a molt. The cray is jelly soft for about 24 hours. They can barely even move right after the molt, and are totally defenseless. Easy pickens for another hungry crayfish. I also have noticed that the Orconectes species seem to be a bit more opportunistic (read cannabalistic) than the Procambarus species that I have kept. Thank you all very much for the positive comments and compliments! My whole family has really enjoyed the "making" of this tank. I think that it may have just been a claw left over from a molt as I believe we counted 5 again today With what has been said in regards to stocking rates, there should be no real issue then for cover as there are at least as many good hiding spots as there are crawdaddies. ...as to talking to my fish while I shoot pictures...Usually my wife and I are cussing them! Absolutely beautiful pictures! I love the crays! Beautiful shots! Very Nice Tank! The Crays are a ton of fun to watch and eat ANYTHING including decaying wood. We made a collecting trip up to a low water bridge this weekend to collect some more plants for them to consume. As it has been suggested by a few people, the crayfish/darter combination has not worked out well for the darters. 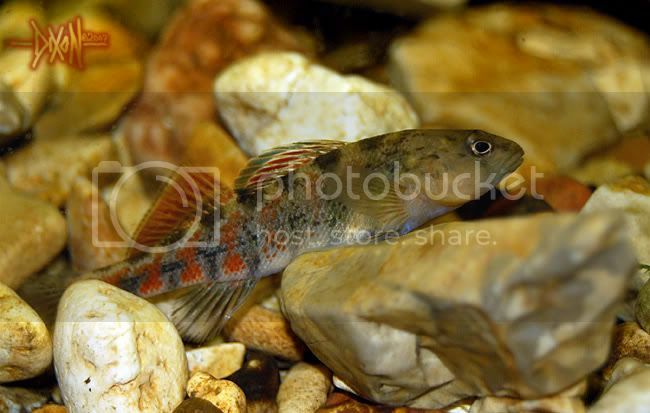 Of the original darters collected only 3 or 4 female "Orange Throat" E. spectibile have survived. It appears the crayfish were ambushing them while they slept. The "Shiners" on the other hand are doing well and have grown considerably. We are working on a "wish list" of target species to try to collect this Spring. I think a few more of the Shiners and a few "topminnows" would nicely round out the tank. Sorry to hear about your crayfish and darter losses. Just yesterday I had a large crayfish that was residing in my rosy red tank manage to not only escape that tank (which has only a loose mesh lid) but get into the adjacent tank (which has a hood with a hinged flap). I wish I could have seen it! Hopefully she and the little snappers in the tank won't bother one another. Awesome tank! Great pictures! Thanks for posting them. Added a few more shiners too...got to use my new minnow trap. It was a little "rough" on the fish. I may have mis-ID'd the Shiner...I'll post pics later. Nice cray! That one looks like a male.